It is with profound sadness Glamorgan County Cricket Club confirms the passing of former player and Coach John Derrick at the age of 54. The warmth and affection for a man known across the professional and recreational game simply by his initials JD, was apparent last December at The SSE SWALEC when a sell-out dinner was organised in the National Cricket Centre to raise funds to assist John and his family with his treatment following the diagnosis of a brain tumour last summer. The event, organised jointly by his beloved county, Cricket Wales and the PCA Benevolent Fund, had such a waiting list that almost three times as many people who actually attended the event could have been present and raised a glass to toast one of the good men in the Club’s recent history and in Welsh cricket overall. In terms of silverware won, JD was Glamorgan`s most successful coach of recent times, having been at the helm during both 2002 and 2004 when, under the captaincy of initially Steve James and then Robert Croft, the Welsh county twice won the National One-Day League. The first title was achieved in nail-biting circumstances at Canterbury where Glamorgan defeated Kent in an epic contest by just four runs. The second was achieved in more emphatic style with Glamorgan clinching the silverware after defeating Lancashire at Colwyn Bay, still with three games to play. The one-day titles in 2002 and 2004, plus the appearance at Twenty20 Finals Day in the latter summer at Edgbaston, were a worthy reward for John, who previously had been the assistant to Duncan Fletcher when the Club won the County Championship title in 1997. JD also spent a series of summers overseeing the development of a host of young players in the county’s 2nd XI, besides instilling in them the pride of playing for the daffodil county as well as the other expectations and duties as a professional cricketer with his beloved Glamorgan CCC. JD subsequently took over the reins as 1st XI coach and briefly as Director of Cricket and, to his delight, saw his protégé’s secure promotion to Division One in the County Championship during 2004, besides winning the pair of one-day titles and enjoying their best-ever season in the Twenty20 competition by reaching Finals Day at Edgbaston. His guidance and encouragement helped to shape this new generation of Glamorgan cricketers at the start of the 21st century, and so many of these players who he helped to develop were present last December to say “thank you” to JD at the fund-raising dinner in the National Cricket Centre. After an outstanding career in schoolboy and youth cricket, John joined the Glamorgan staff on a summer contract in 1979, besides spending a three-year spell on the M.C.C. groundstaff at Lord’s. 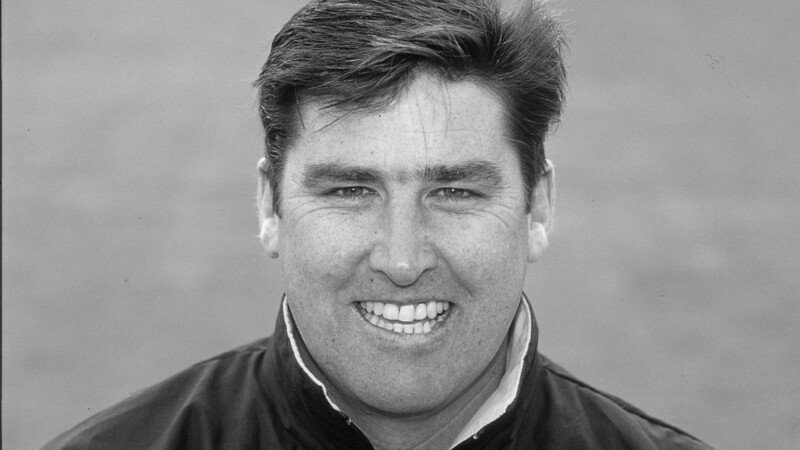 John duly made the first of his 95 first-class appearances during 1983, against Yorkshire at Middlesbrough and subsequently developed into a useful all-rounder, especially in one-day cricket, winning his Glamorgan cap in 1988. With his beaming smile never too far away, the affable all-rounder enjoyed the camaraderie and everything else associated with life on the county circuit at that time, but JD’s appetite for playing the game he loved was undimmed to the extent that he spent several winters during the 1980s playing for Northern Districts in domestic cricket in New Zealand. Behind his relaxed and friendly disposition lay a steely determination with the players in his charge knowing full well that he held a firm hand inside a velvet glove. Whereas other coaches adopted a very laid-back or intense approach, JD was always at pains to nurture a great team spirit and to play the game in a proper manner. JD remained as loyal to Glamorgan as he had throughout his adult life to Aberdare and to his hometown club for whom he had first played in his early teens alongside his father, uncle and brother. Almost forty years later, JD was still regularly turning out for Aberdare CC, despite many long hours, travelling the length and breadth of Wales as National Performance Director of Cricket Wales in addition to his duties as a summariser on BBC Radio Wales where a wider audience had a chance to appreciate his deep knowledge and passion, both for the game and Glamorgan Cricket. JD had become National Performance Director of Cricket Wales during 2010 and the fruits of his labours in this new role have been clearly seen by the recent emergence of the likes of Aneurin Donald, Kiran Carlson and Lukas Carey into the Glamorgan 1st XI. JD embodied all that is good about cricket at both professional and club level. Glamorgan CCC, and Welsh cricket as a whole, has lost a great and loyal servant, and the game will be very much the poorer for his passing aged just 54. “John Derrick was one of my closest friends in the game,” said Hugh Morris Glamorgan Chief Executive. “We started playing together for Welsh Schools at U15 level and were roommates in our early years at Glamorgan. He was always a hugely popular member of the dressing room and universally liked throughout the game. Cricket Wales Chief Executive Peter Hybart added, "JD was an inspiration to young men, women and parents as they followed their dream of representing Wales age-groups, Glamorgan and England. He had an unrivalled passion for cricket at all levels throughout the length and breadth of Wales and will be so sadly missed by the whole Welsh cricket family."